Mike Types: And the beat goes on. Sometimes all it takes is reading a few blog posts to get an idea for a new post of my own. 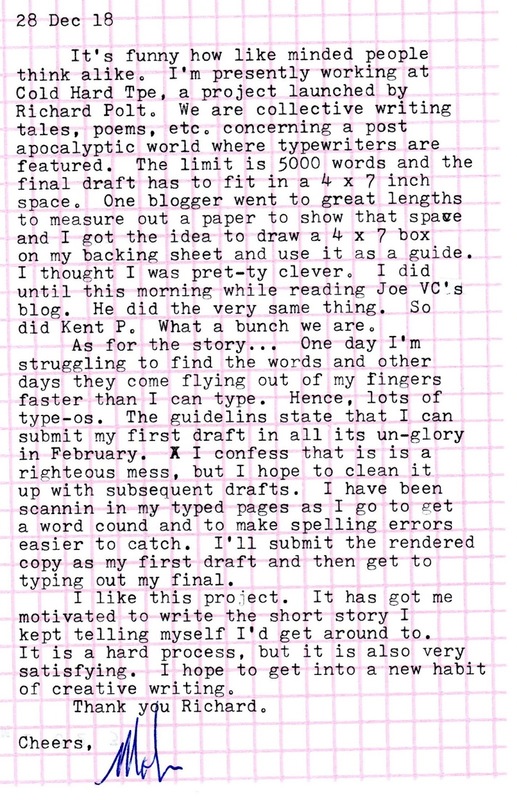 I was reading Joe VC's recent post regarding the Cold Hard Type project. I started entering my comments when I suddenly realized I had too much to say. Now my comments have become this post. Hope you're reading Joe and Kent. Great minds think alike! Good luck on your project. Any chance I can see a draft of your story? I'll by typing up my latest draft this weekend. Not quite finished. Need to get to the end. Stuck. Errgh. Don't mind sharing, though. I have it scanned to Google Docs. Free spirit living the natural life. Self proclaimed geek, writer, musician, obstacle course runner and barefoot runner. ...and then, the light came back on. Power? We don't need no stinking' power.